Shopping cart and checkout are the most crucial parts of any online store because this is where customers usually abandon. 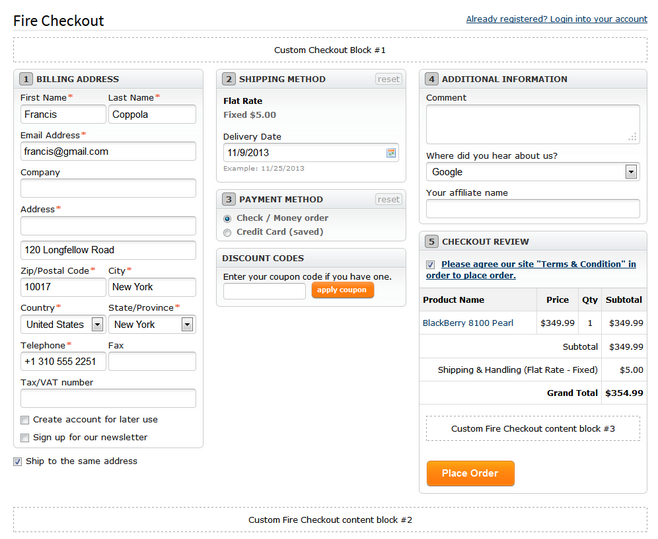 Crafting the right checkout process is not as simple as it seems. Currently there are two main scenarios for checkouts: multi-step (available in Magento by default) and one step solutions (available as extensions). What is better — one step checkout or multi-step? God knows. A lot of Magento website designers and online store owners believe that one step checkout is a silver bullet for your store and it converts like crazy. We have many customers asking to install one step checkout modules, but usually these requests are driven by the mere popularity of this kind of extensions. It is said they improve usability — but real usability researches, in fact, prove it quite wrong. There is a company called Baymard Institute that runs a lot of usability researches and compiles comprehensive usability reports (available to buy only). Before you decide to get a one step checkout extension we suggest you read their article on why the checkout process should be linear. In a nutshell — users tend to get confused when they see multiple forms on one page, they start to think that certain might depend on each other and are not sure what information should be entered in the first place. You may say that it’s an outdated information because the article was written in 2012, and e-commerce world is evolving very fast. But have you ever thought why the top online sellers actually use multiple-step or multiple-page checkouts? Everything depends on the target audience and on your specific business: what works for Amazon might not necessarily work for you, but we recommend you have your own little research on this before you decide which option you will go with. We are going to cover a few extensions of each type and share our experience and opinion about them. 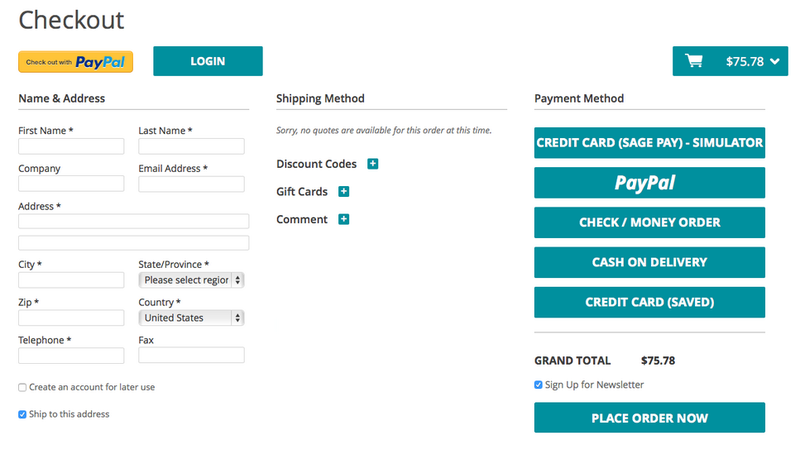 This multi-step checkout extension is absolutely worth checking out. Its popularity score at Magento Connect is unfortunately extremely low, but just look at it: the whole process is split into 4 clear steps with a progress bar on top that guides the user and shows what is left to be filled in. The steps that are completed become links, so users can always go back and edit something. The drawback for this extension is limited payment method support: its developers report that it has been tested only with SagePay by Ebizmart and PayPal Express. This checkout looks like really awesome! It has a very clean layout, 3 steps to complete with a very smooth transition between the steps. All further steps are always visible but still inactive and the user clearly sees what is left. Shipping information fields are very nicely validated, and when you enter a zipcode the city/state/country will get auto-detected. Auto-detection is also present at payment step — no need to manually select the type of the credit card. 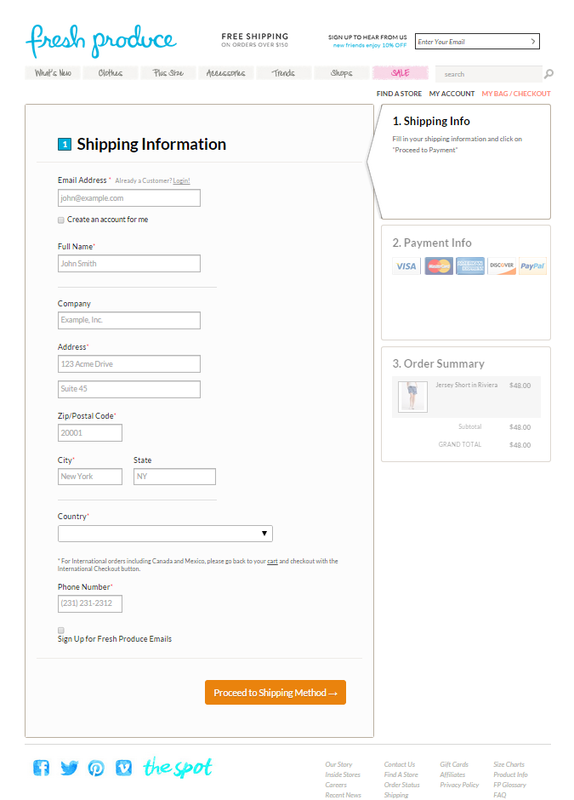 Awesome checkout works great with the most popular payment methods (PayPal, Authorize.net, SagePay, PayOne and a few others) and shipping carriers (FedEx, UPS, DHL). We worked with this extension a few years ago and had certain issues, but hopefully the team have got them fixed by now. The styling of this checkout is a bit difficult and the layout is fixed, but extension developers claim they had very high conversions on Enterprise projects with this look and decided to go with it. Magento native one-page checkout with an accordion and a progress bar on the right is not bad at all – if we skip the first step! The first step is a mess — users can’t distinguish correctly between the two blocks, two radiobuttons (Guest User or Register New User) as well as the two fields on the right for existing users. 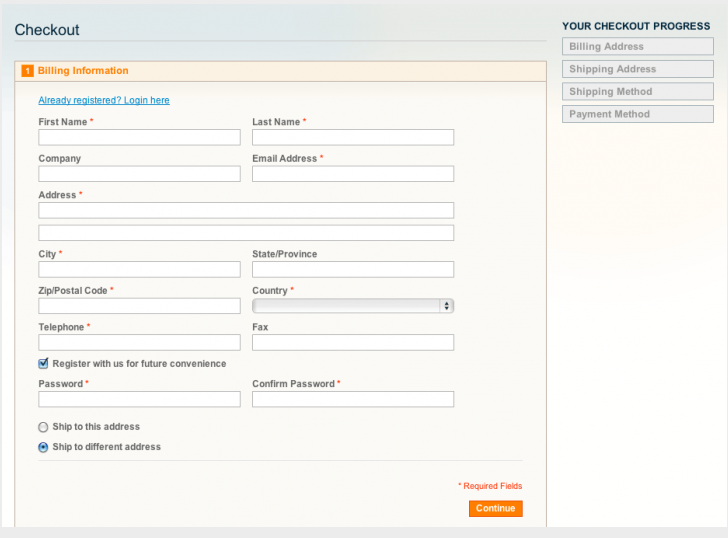 However, if we get rid of the first step — we get a nice trimmed checkout process. (free) by Anders Rasmussen does the trick: it gets rid of the first step and adds an option to create an account at the billing step. We never had a single problem with this checkout. Just like any other one step checkout module it presents all of the steps on one page. Everything is extremely configurable and compatible with many payment gateways. Highly recommend! One step checkout by OneStepCheckout 🙂 It comes second just because it’s more expensive than FireCheckout and supports fewer payment methods. Otherwise the quality and features are great! We noticed that usually (but with some exceptions of course) the extensions offered for free have some shortcomings. One step checkout by IWD is responsive, works with many payment methods, but does have a few bugs you might have to play around. If you are unsure whether you really need to buy a good one step checkout module then one step checkout by IWD can be good to try and see how it goes. This extension provide the same functionality as the previous modules. You can switch between three- or two-column layout and it works with custom order/customer attributes. We have many clients from Scandinavian countries, and Klarna payment method is extremely popular over there. 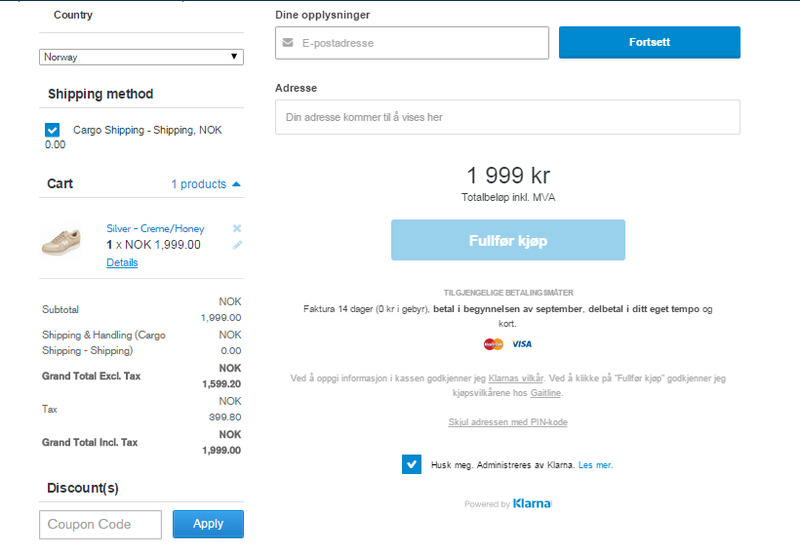 Klarna Checkout integrates with Klarna payment method (and only with Klarna), but at the same time it’s quite buggy and almost impossible to be properly styled. Just like with anything else, think about your own business and your own target audience because there is never an ultimate approach for checkout process. If you think that certain solution is comfortable for you — it doesn’t necessarily mean it will be comfortable for your customers. User behavior can’t be guessed, neither can it be logical because they are not robots. To get more information about the option that will work for your website consult usability professionals or experienced Magento designers. Or there is one more way — try both options, run some A/B tests and manual user testing to see what converts best, and only then you will know if you did it right.